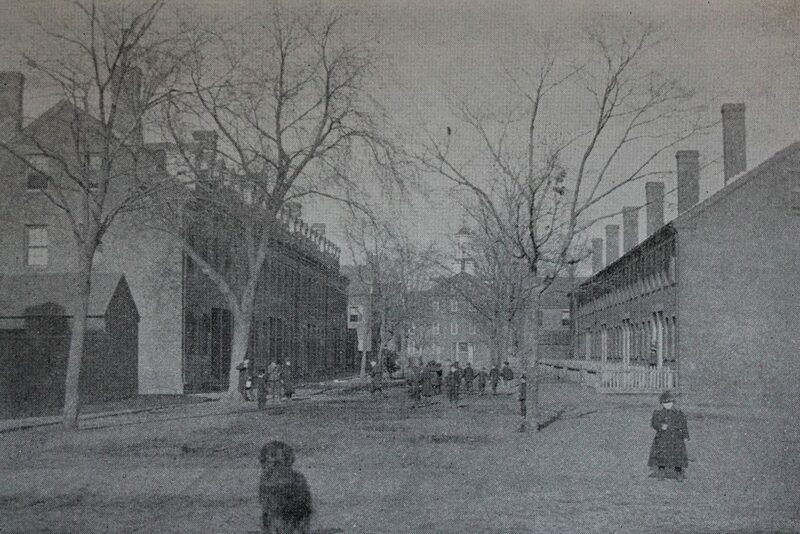 Looking north toward the Hadley Company mills, from the corner of Canal and Center Streets in Holyoke, around 1892. Image from Picturesque Hampden (1892). The caption of the first photo reads “Twelve o’clock at the Hadley Mills,” and it shows a group of workers leaving the Hadley Company thread mill in Holyoke, evidently on their lunch break. The factory is among the oldest in Holyoke, and was built around the late 1840s by the Hadley Falls Company. This company played a major role in turning Holyoke into a prosperous industrial center, including building the dam and canal system, but it was hit hard by the Panic of 1857 and the subsequent recession. The company’s assets were liquidated in 1859, and were subsequently acquired by the newly-established Holyoke Water Power Company. In 1863, these mills here on Canal Street became the Hadley Company, a thread manufacturer that had no direct connection to its similarly-named predecessor. 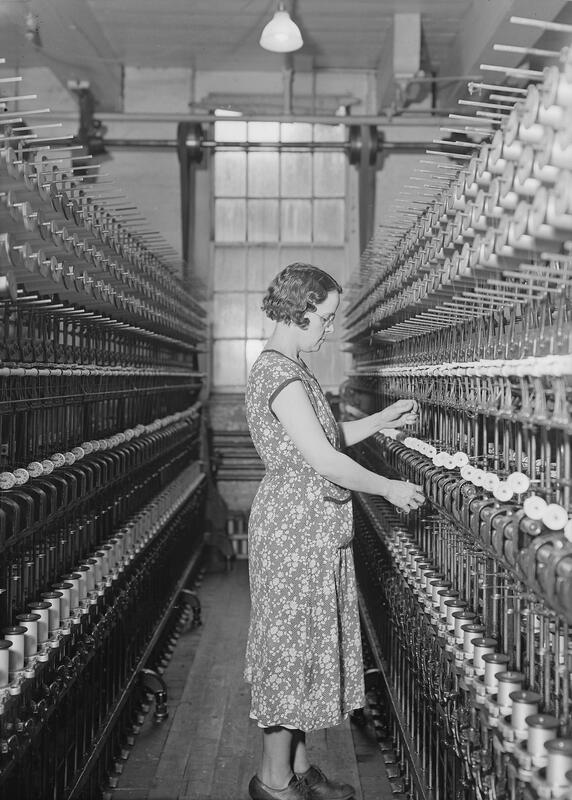 It was part of Holyoke’s booming textile industry, producing a variety of threads, yarns, and twine, and by 1879 it had an annual output of 727,315 pounds of yarn. 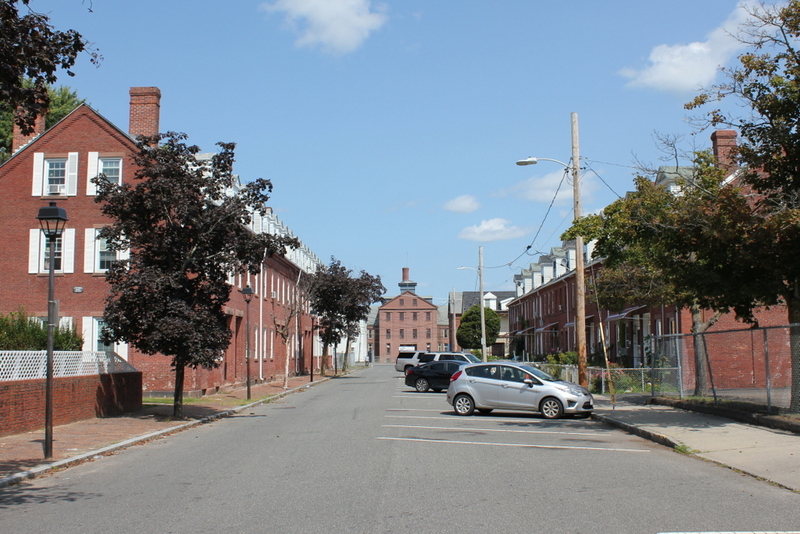 Like most of Holyoke’s industries during this time, the company relied heavily on immigrant labor, and many workers lived in the nearby tenement rowhouses on the other side of Canal Street. 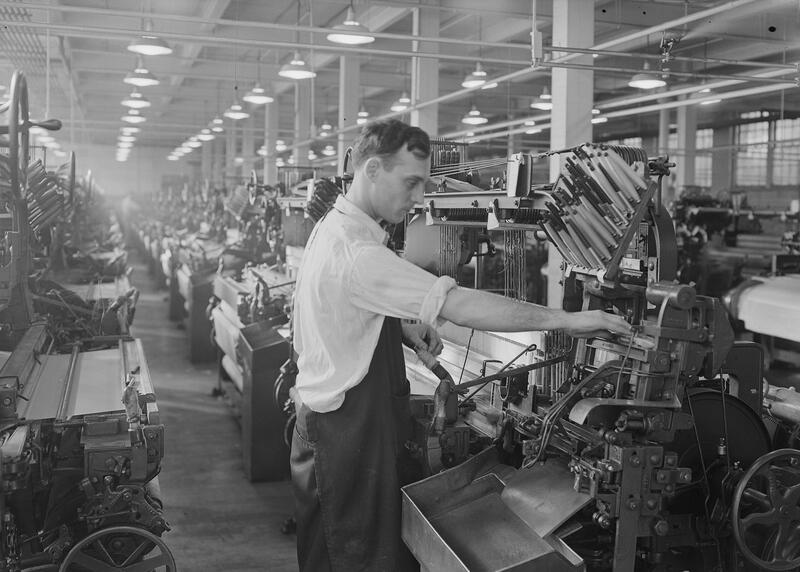 The Hadley Company was acquired by the American Thread Company in 1898, at a time when many industries were consolidating into large corporations. This mill was operated as a division of American Thread for the next few decades, but it was closed in 1928, leaving about a thousand workers unemployed on the eve of the Great Depression. 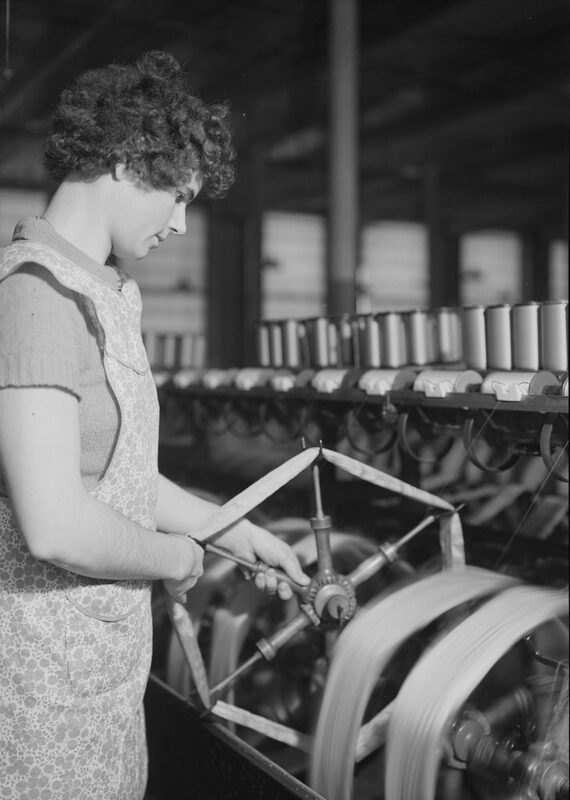 At the time, the New England textile industry was in decline, and the nearby Lyman Mills here in Holyoke had closed just a year earlier, leaving a similar number of unemployed workers. However, it would only get worse for Holyoke, which would continue to lose its industrial base throughout the mid- to late-20th century. By the 1940s, this mill complex had become the home of the Graham Manufacturing Company, which was later acquired by Johnson & Johnson. Today, the former Hadley Company property has a variety of different owners, but many of the historic mill buildings are still standing, including the three in this scene. The building in the center has lost its cupola, and the fence in the foreground is long gone, but otherwise the scene is still easily recognizable from the first photo 125 years ago. 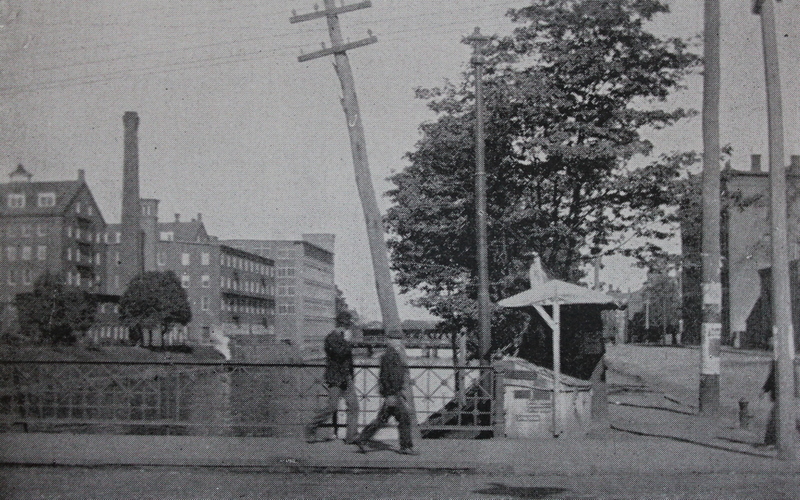 Looking north on the Second Level Canal from the corner of Dwight and Race Streets in Holyoke, around 1892. Image from Picturesque Hampden (1892). This scene shows the view looking north along the Second Level Canal, facing the opposite direction from the views in an earlier post. On the left side of the canal is the Lyman Mills complex, which was built in stages starting around 1849-1850. The earliest of these buildings were the two gable-roofed buildings on the far left, with the dormer windows on the top floor. They were originally built for the Hadley Falls Company, but were subsequently acquired by the Lyman Mills corporation, which was established in 1854. 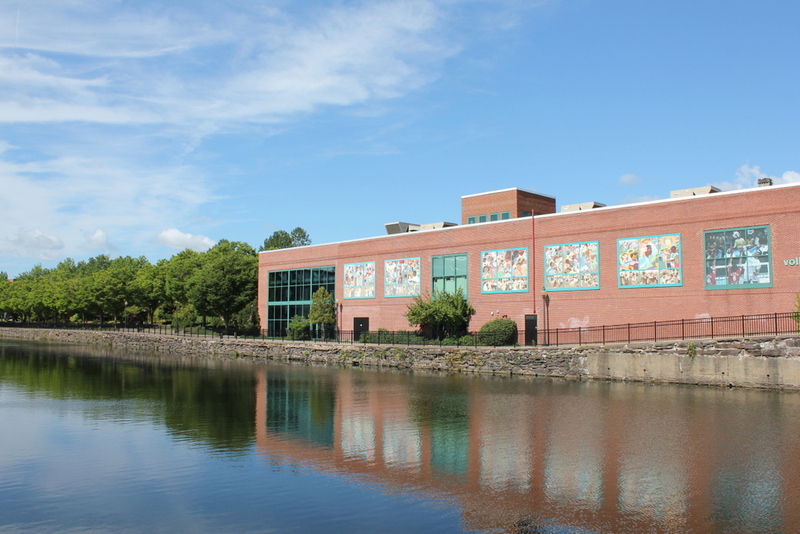 The Lyman Mills became a major producer of textiles, and steadily expanded the facility over the years, until it included most of the large block between Lyman Street, Dwight Street, and the First and Second Level Canals. According to the History of the Connecticut Valley in Massachusetts, published in 1879, the mills had a total floor space of 8.5 acres, and operated 1,556 looms and 74,888 spindles. The company employed about 1,200 people, about two-thirds of whom were women. This workforce was largely comprised of immigrants, and many lived in company-owned tenements on the other side of the First Level Canal, near to High Street. The company had over 1,300 employees by the turn of the century, shortly after the first photo was taken. The mill complex continued to expand during this time, including the construction of the building on the left side of the present-day scene. 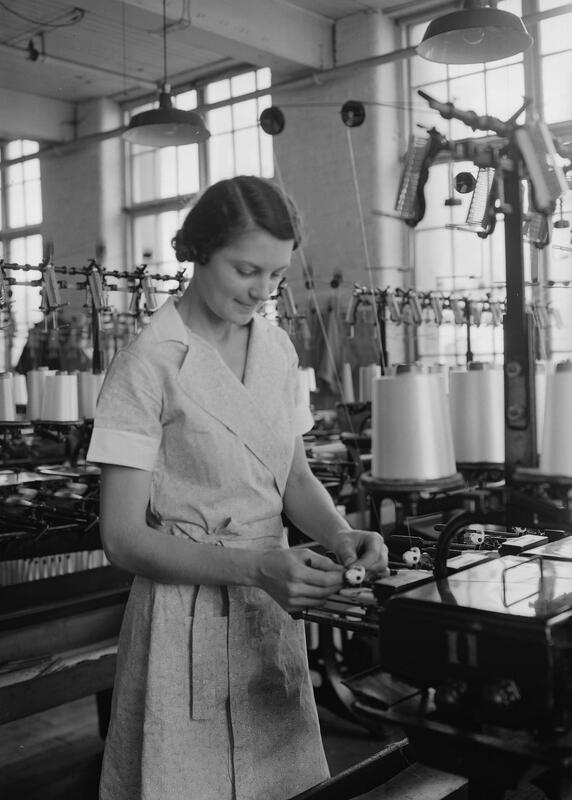 However, by the 1920s the New England textile industry was in decline, and faced increased competition from southern manufacturers. The Lyman Mills remained profitable, but its shareholders decided to liquidate the company’s assets instead of continuing to produce textiles. 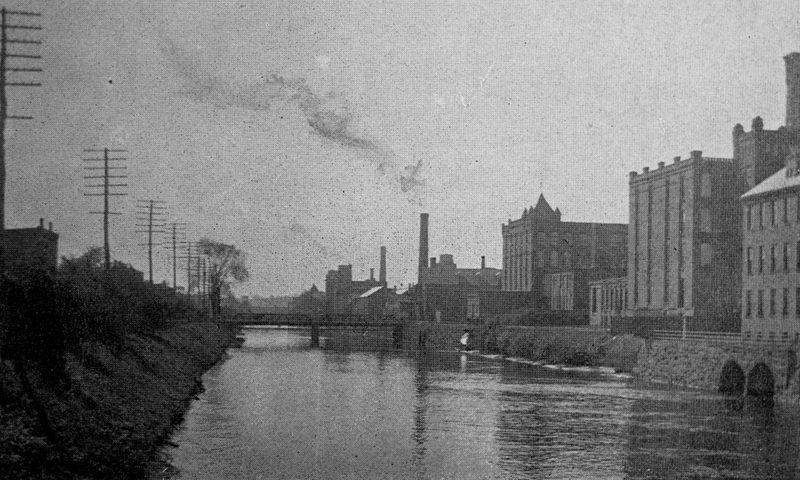 As a result, the mills closed in 1927, leaving about a thousand employees without work, and the property was sold to the Whiting Paper Company, whose factory was located directly adjacent to the Lyman Mills, just out of view to the left of the first photo. The Whiting Paper Company had been founded here in Holyoke in 1865, and over the years it became one of the nation’s largest paper manufacturers. Its founder, William Whiting, served as mayor of Holyoke and was elected to the U. S. House of Representatives, and his son, William F. Whiting, also had a notable political career, serving as Secretary of Commerce during the Coolidge administration from 1928 to 1929. The younger Whiting had taken over the paper company after his father’s death in 1911, and during the late 1920s he oversaw the conversion of the Lyman Mills from textile to paper production. The Great Depression hit soon after, although the company managed to survive, and it remained in business here until closing in 1967. Today, this scene has undergone many changes in the 125 years since the first photo was taken. 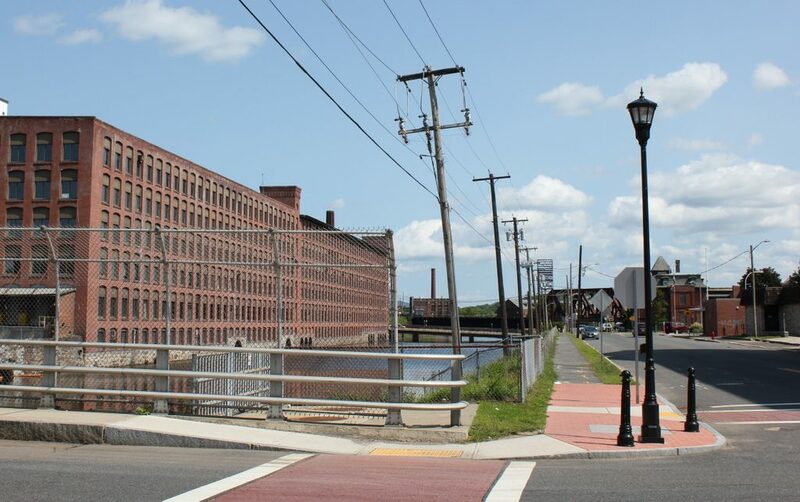 Nearly all of Holyoke’s once-prosperous industries are long gone, and the city now faces significant problems with poverty and vacant properties. Many of the historic factory buildings have been demolished, although the former Lyman Mills and Whiting Paper complex is still standing on the left side of the canal. It is now a mixed-use property known as Open Square, and it is part of the ongoing revitalization efforts here along the canals in downtown Holyoke. 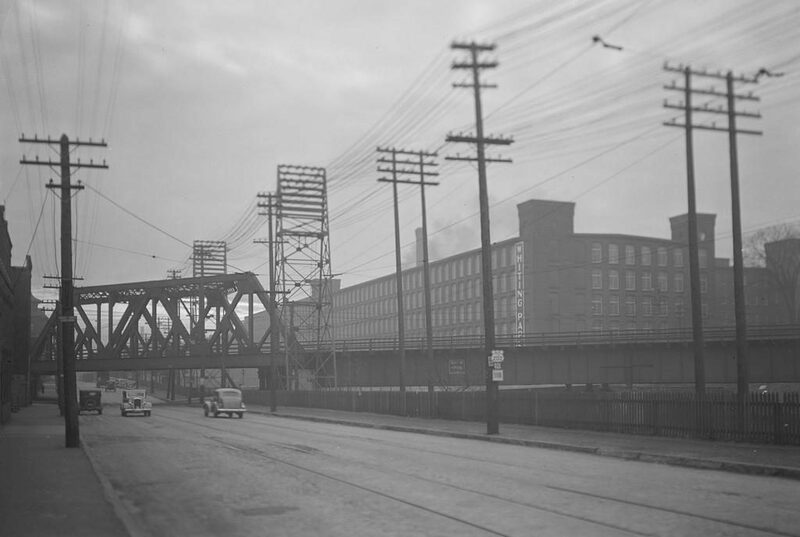 The William Skinner Silk Mill, as seen from the Dwight Street bridge over the First Level Canal in Holyoke, in 1936. Image taken by Lewis Hine, courtesy of the U. S. National Archives. William Skinner was an English immigrant who came to the United States as a young man in 1845. While in England, he had received some training in the silk industry, and he put this to use soon after his arrival in America. At the time, the United States manufactured very little silk, with most of the country’s supply coming from overseas, but by the early 1850s Skinner had established his own silk mill. Known as the Unquomonk Silk Company, it was located along the Mill River in Williamsburg, Massachusetts, in a village that came to be known as Skinnerville. The company prospered under Skinner’s leadership, and by the early 1870s it had become one of the country’s leading producers of silk. However, this came to an abrupt end on May 16, 1874, when a dam broke on the Mill River, upstream of Skinnerville. The 100-acre reservoir quickly emptied, sending 600 million gallons of water rushing down the valley. Several villages and factories were destroyed in the resulting flood, and 139 people were killed. Almost all of Skinnerville was destroyed, including the Unquomonk mill, and only Skinner’s home, known as Wisteriahurst, survived relatively unscathed. Skinner’s losses amounted to nearly $200,000 – almost $4.5 million today – and none of it was covered by insurance. He faced potential financial ruin, but was determined to rebuild, although not in Skinnerville. After evaluating is options, he chose to move his company to Holyoke, which was in the midst of becoming a major manufacturing center for paper and textiles. Here, the Connecticut River produced far more water power than the Mill River could have ever provided, and he was also enticed by a lucrative offer from the Holyoke Water Power Company. The company provided him with a mill site that was rent-free for five years, and also sold him an entire city block for his home, for the nominal fee of $1. In relocating to Holyoke, Skinner brought his entire house with him, moving Wistariahurst to his lot at the corner of Cabot and Pine Streets. He built his factory on Appleton Street, on the current site of the Massachusetts Green High Performance Computing Center, and by the end of 1874 he was once again producing silk. Despite his heavy losses in Williamsburg, Skinner once again became a wealthy man, with his company regaining its prominence within the American silk industry. This is an absolutely modern mill in every respect, the latest devices for weaving and all processes of textile manufacture having been installed. The great weave rooms are filled with looms six abreast, all of them driven by individual electric motors, so that there is no shafting in sight. A special feature of the new mill is the lighting. All of the available space in the outside walls has been given over to windows, so that there are in all 1,000 windows. The walls are painted white to increase the refraction of light, and the top floor is made especially light by a saw-tooth roof. This mill is devoted largely to the manufacture of colored linings for the cloak and suit trade, as well as to picking, inspecting and finishing. The department of braid manufacture also occupies a portion of this building. The bright vari-colored warps and wefts on the many aisles of looms, which pulsating shuttles are weaving into fabrics of all hues and colors, make a sight that one will long remember. William and Joseph Skinner both ran the mills until their deaths in the late 1940s, and their children then inherited the company. However, by this point many of the industries in New England’s once-prosperous manufacturing centers were in decline. 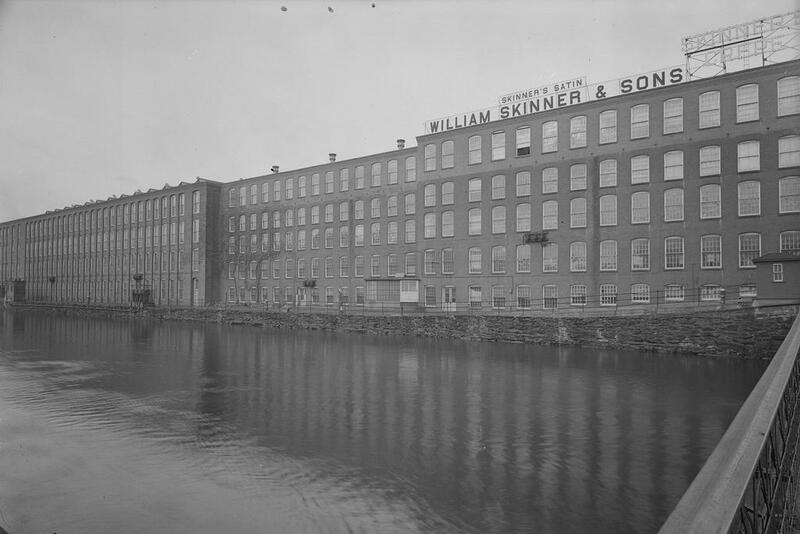 The Skinner company faced increased competition in the silk market, along with old facilities and manufacturing processes that were becoming obsolete. It produced its last silk in 1956, a little over a century after William Skinner had established the company in Williamsburg, and the family finally sold the company in 1961. The new owners, Indian Head Mills, closed the old Skinner mills two years later, in 1963. Then, in 1980, the mill building in the first photo, which had once been touted as the largest silk mill in the world, was destroyed by a fire. 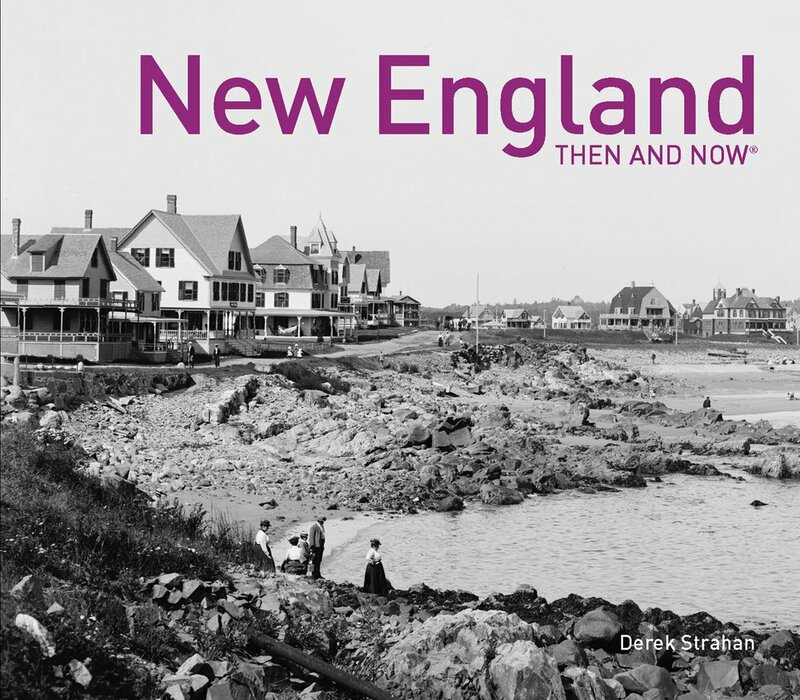 Today, there are no traces left from the first photo, except for the canal itself, and the site has been redeveloped as Holyoke Heritage State Park. The park is now home to the Holyoke Children’s Museum and the International Volleyball Hall of Fame, both of which are located in the building on the right side of the present-day photo. Looking south from the Dwight Street bridge over the Second Level Canal in Holyoke, around 1892. Image from Picturesque Hampden (1892). 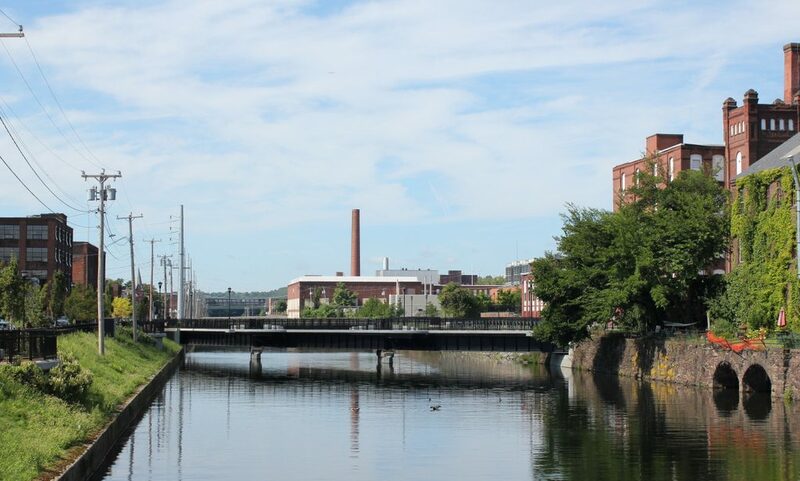 Holyoke’s extensive canal system was developed starting in the mid-19th century, and provided water power for the many factories that were built here. By the time the first photo was taken in the early 1890s, the city was at its peak of prosperity as a manufacturing center, and the Second Level Canal was lined with industrial development along the right side. These included, on the extreme right side of the photo, the Beebe & Holbrook Paper Company, one of the city’s many paper mills. Just beyond it were two matching factory buildings of the Merrick Thread Company, and further in the distance, on the other side of Appleton Street, was a mix of smaller industrial buildings owned by a variety of companies. Only a small portion of the Beebe & Holbrook mill is visible in this scene, but it was built in 1871-1872 as the Hampden Paper Company. It subsequently became Beebe & Holbrook in 1878, and in 1899 it was one of the many paper mills that merged to become the American Writing Paper Company. Each mill, including Beebe & Holbrook, continued to operate as a division within American Writing Paper, and at one point this trust combined to produce 75 percent of the country’s fine paper. Poor management and perennial labor troubles ultimately helped bring about the company’s demise in the mid-20th century, and its assets were liquidated in the 1960s. However, many of its former mills, including Beebe & Holbrook, are still standing in Holyoke today. Silk cord, soft finish, satin finish spool cottons and fine yarns are made, the value of the yearly product being a million dollars or more. About 4,000,000 dozen spools of cotton are made during the year. Over 1,100 hands are employed, and these receive upwards of $26,000 per month. The furnishing of a thread and bobbin fitted for use in the shuttle of a sewing machine, thus avoiding the necessity of fitting the iron bobbin in the usual way, has grown to be quite an important branch of the business, which this company controls under contract with the patentee. Like Beebe & Holbrook, the Merrick Thread Company was later absorbed by a trust when it was acquired by the American Thread Company in 1902. Then, at some point in the 20th century, the facility received a direct rail link when a railroad bridge was built diagonally across the canal, as seen in the present-day photo. 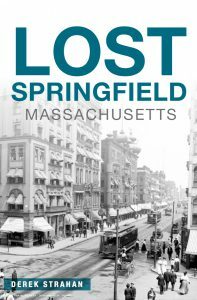 However, like most of Holyoke’s other industries from the 19th and early 20th centuries, the company has since gone out of business. The buildings later housed other companies, although mill number 2 was destroyed by arson in 1993, and the site on Appleton Street is now a vacant lot. Mill number 3 is still standing, behind the trees on the right side of the present-day photo, but its windows are boarded up and it appears to be vacant. 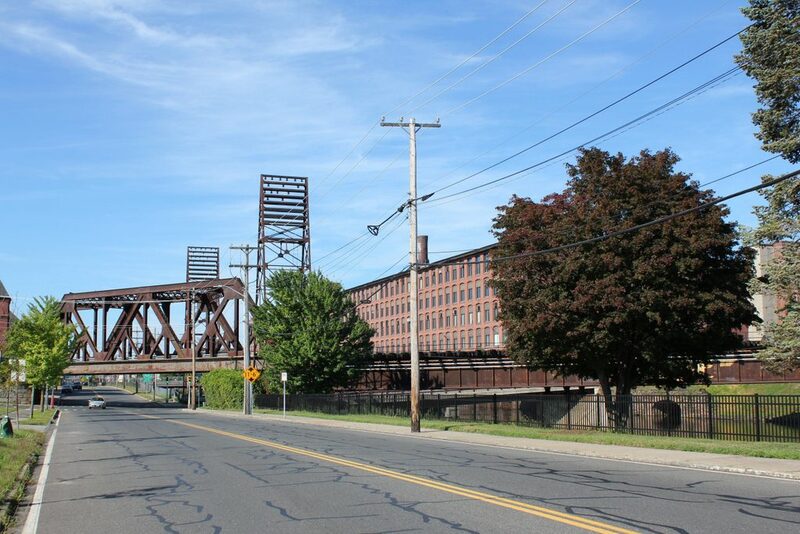 Overall, the only significant improvement to this scene has been the conversion of the railroad bridge into a pedestrian walkway in 2015, and it is now part of the Holyoke Canal Walk. Looking southwest on Canal Street, toward the corner of Lyman Street in Holyoke, in 1936. Image taken by Lewis Hine, courtesy of the U. S. National Archives. The Lyman Mills company was incorporated in 1854, in the early years of Holyoke’s industrial development. It was located in the area between the First and Second Level Canals, on the south side of Lyman Street, and over the years its facility grew to include a number of mill buildings. The earliest of these, not visible from this angle, were built in 1849-1850, and were originally used by the Hadley Falls Company before being acquired by Lyman Mills. 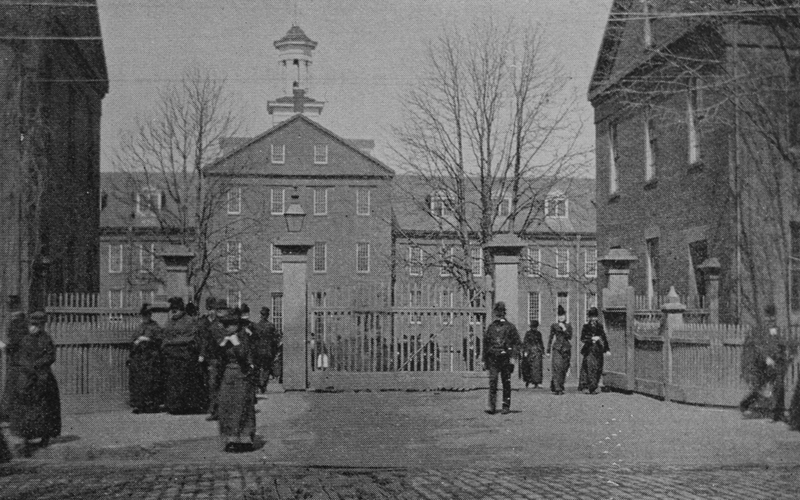 Other buildings, including the large one in the distance on the right side of the scene, were added later in the 19th century, and the company became a major producer of textiles. 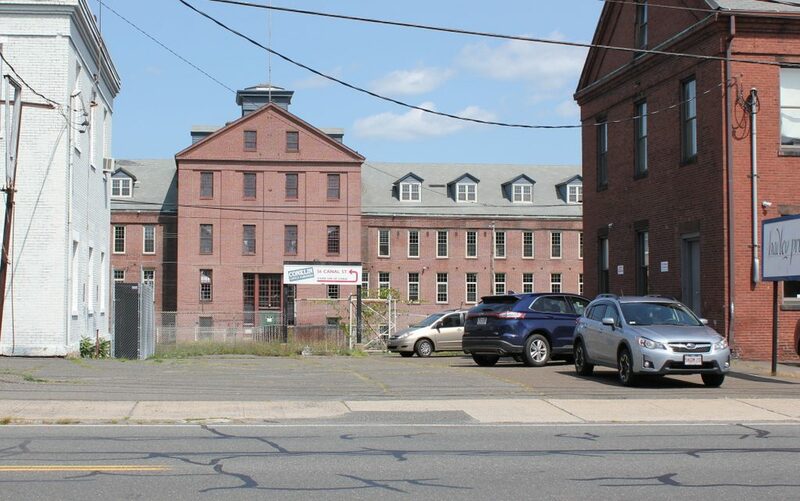 It also employed a significant number Holyoke residents, including many of the city’s French Canadian immigrants, and by the turn of the century it had a workforce of over 1,300 people. However, as Hine’s caption indicates, the Lyman Mills corporation was liquidated in 1927. Although still profitable despite increased competition from southern manufacturers, the shareholders were evidently more interested in selling the company’s assets instead of continuing to operate it as a textile mill. Over a thousand employees were put out of work on the eve of the Great Depression, and the property was sold to the Whiting Paper Company, whose original mill was located directly adjacent to the Lyman Mills complex. Founded in 1865 by William Whiting, this company went on to become one of the largest paper manufacturers in the country, and Whiting enjoyed a successful political career as mayor of Holyoke and as a U. S. Congressman. After his death in 1911, his son, William F. Whiting, took over the company and oversaw the expansion into the former Lyman Mills buildings in the late 1920s. The younger Whiting was a longtime friend of Calvin Coolidge, and in August 1928 Coolidge appointed him as the U. S. Secretary of Commerce, replacing Herbert Hoover, who would be elected president a few months later. Whiting served in this role for the remainder of Coolidge’s presidency, until Hoover’s inauguration on March 4, 1929. The conversion of the Lyman Mills into paper production, along with Whiting’s brief tenure as Secretary of Commerce, occurred just a short time before the stock market crash of October 1929. By the time the first photo was taken seven years later, the country was still in the midst of the Great Depression. Like the rest of the country, Holyoke was hit hard by the Depression, but the Whiting Paper Company managed to survive and remain in business for several more decades. 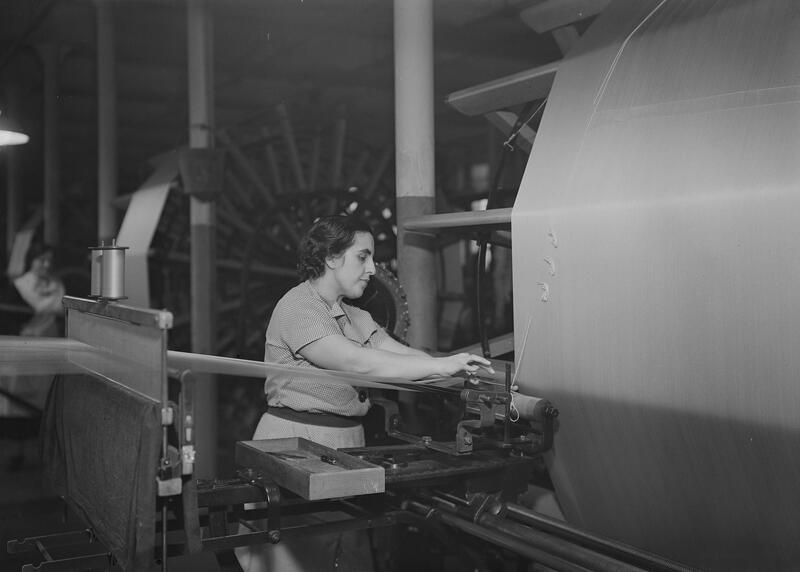 However, Holyoke continued to see economic decline throughout the mid-20th century, with most of its major manufacturers closing or relocating, and the Whiting Paper Company finally closed in 1967, just over a century after it had been established. Today, however, this scene has hardly changed in more than 80 years since Lewis Hine took the first photo. Although no longer used to produce textiles or paper, the Lyman/Whiting complex is still standing in the distance, and has been converted into a mixed-use property known as Open Square. Closer to the foreground, the same railroad bridges still carry the tracks over Canal Street and the Second Level Canal, and even the transmission towers are still standing, although they do not carry any electrical wires anymore.